It has been a while since I posted on this blog and while it may have seemed like my usual winter hibernation, I’ve actually been busy enough in the background doing shoots for this blog. I just didn’t seem to get around to actually posting them! So this shoot is actually from January, would you believe it, and it was inspired by about 3 days we had this winter where it would seem like London might actually get some snow! Now that didn’t last; I believe the little snow we did get only lay on the ground for about 3 hours before it melted, but it got me yearning to do a snow-themed shoot. 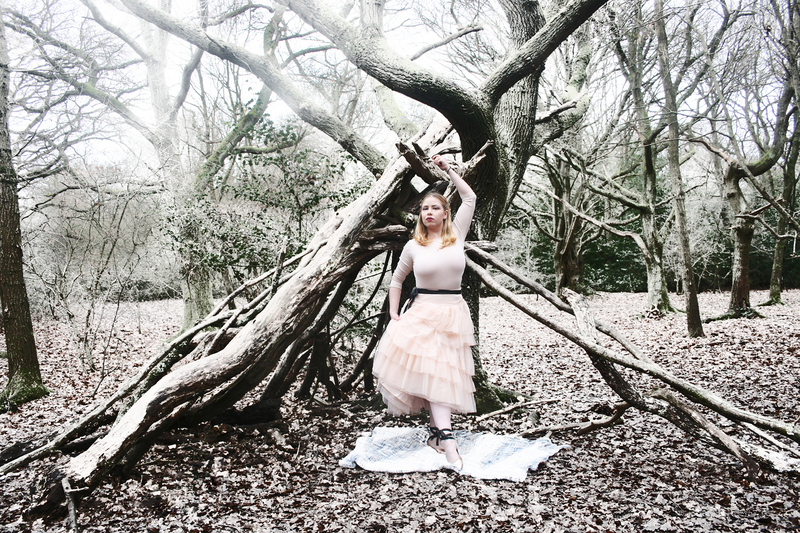 This shoot was also inspired by a Harper’s Bazaar UK shoot from the December issue and I was determined to have this snowy-woodland shoot only I thought of adding some elements of fairytales to mine to make it different. The most obvious of the fairytale aspects is Snow White with the red apple, but there are other elements too like Sleeping Beauty in outfit two, the Little Red Riding Hood with the red cape and hat and Swan Lake in outfit three.